Short extract from the material used as a structure for Volitional Attention Training, this provides information on memory, attention and the pitfalls that should be avoided at all cost. Evolution also plays a part in our understanding of mental force and the benefits derived from possessing it, with a direct link to Darwin and survival of the fittest. Imagine a history where humans did not possess these types of abilities, would we have ever dragged ourselves out of the primeval world that we occupied? There are mental processes that have to be overcome in order for any individual to live a life, to find a mate, reproduce, to survive! To enable this process, not only does the mind have to be mentally fit, also the physical body has to be healthy and fit. As humans we are constantly under threat from our mind’s activity, we therefore have to understand what is happening when certain moods take over the dominance of our minds, or when we create thoughts that are not congruent with our mental direction. Maintaining the physical body has to form part of this process, if an individual suffers from a physical impairment, is obese, sleep deprived, lacks nutritional balance, inputs substances into the body (drugs), then the consequences of this, result in a human organism that is not in balance, the body and mind do not work as one. If the mind was mentally tough and capable of survival and the body was not, it would not take long for one to adversely affect the other, or vice-versa. Therefore physical conditioning should be equally as important as mental conditioning. Bringing these ideas into attention earlier in this discourse creates an understanding that attention has to be thought about. A stimulus input into the brain creates a mechanism of mental processes, that in turn leads to an amount of mental attention being applied to that stimulus, how long attention is maintained will depend upon the amount of mental force that the individual is capable of bringing to bear upon the stimulus. A stimulus that brings forth an episodic memory will also bring with it the ability for the mind to pay more detailed attention to that particular thought. Episodic memories are those that are encoded into the mind, through an emotional experience, these experiences are capable of coding in the time, place, feelings and details of the event. They are far more real to the mind than attempting to memorize an event to which you are just a passive observer. Semantic memory is generally concerned with knowledge of the world that we live in, there is a difference between knowledge that is factual and personal experiences that have encoded knowledge and understanding with a greater grounding and meaning. Both semantic and episodic memory deals with long-term, rather than short-term memory, a key difference is that episodic memories encode the actual acquisition experience and the context in which the memory occurred. For any combative or martial art technique to become efficient and effective, the coding process will need to support the intended action, techniques will have to become linked to procedural memory. Declarative memory deals with facts and data gained from learning “declarative memory serves to “chunk” or “bind” together the converging processing outcomes reflecting the learning event, providing a solution to the “binding problem” for memory, Cohen, N. Poldrack, R. Eichenbaum (1975). The sea is wet and the sun is hot are example of long-term declarative memories. Procedural memory is concerned with long-term memory including complex motor skills. These skills are first coded into the brain and over time become second nature; you do not have to use a cognitive thought process to access the skills. Playing a musical instrument, driving a car, or combative, martial art techniques, are all examples of procedural memory, “procedural memory enables organisms to retain learned connections between stimuli and responses, including those involving complex stimulus patters and response chains, and to respond adaptively to the environment” Tulving (1985). There is no defined limit to long-term memory, providing that the correct coding procedure occurs then complex motor skills that involve, combative and martial art techniques can be built up. Continued repetition of these movements will lead to a stable procedural memory, which ultimately leads to spontaneous movement, this is arguably the aim of any person engaged in this type of activity. It is important to remember here that any human movement can be learnt in a manner that is not congruent with natural movement, it is maladaptive. Continual repetition of techniques that do not follow this premise will eventually cause damage to the organism. Occupations that involve high stress and the potential for deadly force encounters are particularly exposed to incorrect episodic memory imput, and again, if continued exposure to this type of maladaptive behaviour, could have disastrous consequences, “in the blink of an eye, the officer snatched the gun away, shocking the gunman with his speed and finesse. No doubt this criminal was surprised and confused even more when the officer handed the gun back to him, just as he had practiced hundreds of times before” Grossman, D. (2004). This is a good example of incorrect coding of a maladaptive procedural memory, the officer involved continually practiced this disarm, until he had coded it into his mind, in doing so creating a spontaneous response, it had become second nature to him, I term this “negative loop coding” (NLC) which should be avoided for obvious reasons. The disarm in itself was never the problem, in fact over time several episodic events could have occurred in this officer’s life, for example he may have already been associated with lethal force encounters, he may have had colleagues die in the line of duty, any of these high emotional states would have led to an episodic memory. Once the officer had started to pay attention to this training loop and began to practice the disarm in all sorts of situations, both at work and at home, he had started to encode procedural memory, the only problem with the training was the handing back of the weapon! to do it again and again, and again! A key point in this behavioural pattern is volition used to pay attention. Once attention on the training pattern had begun his brain would have been firing neurons at a fast pace, to start the encoding, drawing with it greater amounts of mental force, enabling focused thoughts on the reasons for the practice to be thought about, in other words the officer was undertaking, mindful attention. Tulving, E. (1985), How many memory systems are there? American psychologist, vol. 40, April 1985. Printed in USA. Grossman, D. Lt. (2004). On Combat: The Psychology and Physiology of deadly conflict in war and in peace. Millstadt, Il: PPCT research publications. Psychology of Confrontation – Part II Startle Reflex and the surprise attack. Startle Reflex and the surprise attack. In the previous blog I discussed some advanced thought processes, with regard to some of the interactions of the mind and the body when engaged in a violent encounter. In this article, I want to look at some of the physiology that occurs as well as the psychology. By physiology I mean bodily reactions that can be predicted. Firstly I want to examine our body’s natural protection mechanism, the “Startle Reflex”. Startle Reflex is one of the body’s first physiological responses to a surprise stimulus “startle reflex, refers to bodily reflexes that occur involuntary in response to an unanticipated external stimulus” Chapél (1991). We know from research and experiments carried out that the body has in-built protection systems designed to protect the body from harm. One of these is the Startle Reflex, also referred to as a “Flinch”. All humans will respond in a certain manner when a startling stimulus occurs, for example; blinking, upward movement of the shoulders, head tucking in and down, bending of the arms and their withdrawal into our core, bending of the legs and their withdrawal into our core, as well as several facial expressions and various twisting of the whole body and limbs. In the majority of Martial Arts schools there is no inclusion of this within the training of self-defence techniques. Techniques usually start from a punch, grab or kick scenario. So why try to understand this type of reflex? What happens to the body when startled? Firstly if you teach reality-based self-defence techniques and exclude this from your curriculum, you are not giving your students all the knowledge possible to enable them protect themselves. You must however remember that the startle reflex only occurs when you are startled, this may be an obvious statement, but it is very important that a clear distinction is made between: being caught off guard and completely by surprise with no awareness of the impending attack; and being attacked, responding in some kind of trained manner, to a confrontation that has already begun, a preamble or pre violence dance has occurred. When you are startled it is due to stimulus being received via your eyes, ears or touch sensory system. These can be categorized as Auditory Startle, Visual Startle and Sanatoma Sensory Startle. The first thing to understand here is that this reflex cannot be trained out! The increase in our body’s reaction to startles is called “sensitisation” where as a decrease is called “habituation”. This means that the body will habituate to a certain point when it continues to receive startle stimulus. For example in the film “We are Solders” with Mel Gibson, when the journalist first appears on the battleground, the explosions startle him. However, during the end scene when others turn up after the battle, his startle reflex had been habituated, to explosions, the new journalist all startle. After a period of time the body will return to normal reactions to this stimulus and the habituated response will become extinct. What this tells us is that we can habituate being caught off guard when attacked and to a degree we can train down a startle reflex. However we would have to be continually training in a method that created a startle all of the time, as soon as we suspend this type of training the reflex will re-initiate itself. When the body enters a startle reflex it moves in a manner that is faster than any other type of body movement. It simply cannot be reproduced by any conscious thought process. Any idea that you can train in a way that uses a flinch or startle response as part of your initial conscious thought process to respond to an attack is unrealistic. The reason is due to the physiology of the body. Another factor to be considered with regard to being startled and the severity of the startle is the situation and environment that you are in at the time. If you are in a dark alley and are alone at night, then the intensity of the startle may well be greater than the same alley during daylight hours. The key areas to consider with regard to Startle Reflex and Martial Arts are; can we train a response that can be used? Can we move intentionally at a speed approaching Startle Reflex speed? There are recorded accounts of people who have trained intensively reacting to a startle stimulus in a trained response manner, while under extreme emotionally charged situations. This would indicate that although the reflex cannot be trained out, it could be substituted for movements similar to self-protection moves that you have trained for. I am not talking about full on blocks or attacks. I am talking about shielding moves of reflex hand swipes across the face – i.e. programming a response that will help protect you if surprised. With regard to moving at the same speed, we have to understand the physiology behind the reflex. The neurons that fire during the reflex action, never reach the conscious parts of our brain. The body has to switch off all the prime mover, fixator muscles and instead use the fast twitch muscles, known as our Antagonistic muscles. Typically the empirical evidence indicates that the body parts that are moving during this action first move back towards our core “The head retracts, shoulders hunch, arms bend and retract, knees bend and our legs withdraw to our core” Chapél (2006), briefly wanting to return to the fetal position. Knowing this and understanding the body’s natural reactions will allow us, as Martial Artist, to prepare our students for a stimulus based trained response to a surprise attack. What comes next is the dump of a chemical cocktail into the blood stream to enable the body to cope with the impending violence. At this stage we will also enter a state of mind that will either help or impede our survival. It’s also important to remember at this point that the attack is a surprise! Your attacker could be lying in wait for you, or stalking you ready to attack at a moment of their choosing, when they perceive you to be at your weakest. There is unlikely to be any verbal warning that the attack is coming, therefore coping strategies for a verbal encounter should not be much of a concern, with this method of attack. This is very much about prior knowledge of your body’s natural protection mechanisms and the simple fact that your only chance of a response during this surprise attack, is to train a stimulus based, programmed response. There is a distinct chance that you may even be shocked into a freeze state, one in which you are incapable of any response. Now we are entering the realm of our body’s physiology and the adrenal dump. What this will do is send the body into a high state of emotion, knowing what this feels like and understanding it, is the first step to coping with the effects on the body. To clarify, this is a surprise attack! First we enter a startle reflex and then the body goes into some type of fight or flight response, due to the adrenal dump. When the situation is changed to a perceived encounter first then the Adrenal dump will come first. Early in this article I spoke about the need to have a very limited response against a surprise attack. We need to look at this in a little more detail here. How are we going to be surprised? As a martial artist, one of the first things that should be taught is awareness, awareness of your environment, the potential dangers and how to avoid them. Lets face it with today’s technology how many times do you see people walking down a street with ear phones in and music blasting out, or they may be totally engrossed in a phone conversation. Colour coding awareness levels has been put forward before (Cooper 1989), with awareness levels running from white to black, white being totally un-aware and black being in the middle of combat. It’s simply not possible to be totally aware at all times, we are all capable of being surprised. Even if we are expecting an assault we can still be startled. So what type of shielding moves of reflex hand swipes should we train. As far as possible they need to mimic the movements that would be made during a startle reflex, it’s no good trying to programme in something that is far removed from the actual moves. We know that both hands will work in a symmetrical manner, this means that they will both retract together. This then can be used in our favour, bringing both hands in back, then up to cover the face, would be one example of a shielding movement. Another could be just one hand being swiped across the face, as if trying to swat a fly away. Both have to be programmed into the responses. We must remember here that these moves are only our initial reflex responses to being surprised; we have yet to respond in a significant way. What I have done within this text is create a clear divide, between being surprised and going into an involuntary startle reflex. I have explained the reasons for this reflex. As our reflex’s are part of our body autonomic nervous system there is not a great deal that we can do, other than train it into an habituated state and one that will need constant re-enforcing to prevent extinction. In the coming chapters a lot of the above information will cross over into other areas, as we delve into the workings of our body and mind. The whole area of knowledge is contained within “Psychology of Confrontation” Chapél (2006). An area of training that I also mentioned above is stimulus training as opposed to scenario based training. This is where training a response to a stimulus takes priority over knowing what the attack will be, what’s key here, is how this type of training can be started and then progressed so that true un-known attacks can be handled effectively by any student, something for later. Psychology of Confrontation – Part I The assumed attack. “Psychology of confrontation” Chapél (2006), (“PoC”) is a very large subject and one that will take more than two articles to convey. However I will make a good start here. This subject covers every aspect of human conflict. I will limit this article to the interactions between two people, one of whom is intent on inflicting violence on the other. Even this very simple start has its problems. The subject of interpersonal violence is a massive one and applying psychology to it makes it even bigger! The ways in which two people interact are also numerous. Let us consider for a moment the different ways that you may be attacked. These can be broken down into two very basic categories. Both of these will bring with them their own specific psychological differences and the type of responses that anyone is capable of applying. Due to the nature of the description the surprise attack means exactly that! It’s a surprise! This will illicit from the victim a startle reflex in some manner. Whereas the anticipated attack will not, due to the fact that a verbal or posture warning will pre-empt an attack. Within the martial arts we have a continuing battle to justify the techniques and conflict scenarios that we teach to students. There are as many different ways to teach a technique, as there are different arts. Some arts teach principles and others teach scenario-based syllabi. We have arts whose teachings are based on traditional techniques handed down through time and arts that work more on a stimulus basis, however the last type is few and far between. In American Kenpo, the self-defence moves are based around conflict scenarios, with the addition of principles and theories. At the higher levels I also introduce stimulus based trained responses. All of this helps the practitioner to analyse the techniques in some depth. The hardest area of all is that of effectiveness of your technique and the reactions that could, with reasonable efficiency, be predicted from your attacker. In the most part, you can be logical in your thought process, but the application of logic is only as good as the foundation that you base your ideas and thought processes on. There is a saying within the field of human endeavour “practice makes perfect”. This in itself is a reasonable saying with good sound logic! The more you practice the better you internalise the moves and the greater the understanding you will have. All sounds very plausible right? So what if you are taught a move, leave the school, go and practice what you have been taught again and again, until you know it without thought and then return to the school only to discover that you remembered the moves slightly differently then you were originally taught and for the past few months you have been practising incorrectly! Sort of blows holes in the old saying! It would be better to say, “ Perfect practice makes perfect”. The trouble is how do you know what is perfect! Teachers in the arts base their understanding on their own experiences, or that of their instructors, once these thought processes become engrained its almost impossible to accept that there may be knowledge and information out there that could help expand your techniques and understanding. The best you can really do is to apply a sound logical thought process to your art. The next real question should be where do we start? So lets start with assumptions! You have two basic choices. Assume that every move you make is most effective and your attacker reacts to each move within a degree of predictability. The techniques that you use are at their most effective. Each of the above assumptions brings its own problems and the psychology required to analyse each of these is different, we have to delve into the mind of both participants in this violent encounter. In assumption 1 it can be read as saying “your moves are ineffective, so you need to have a lot of techniques ready” – this is making an assumption that your moves fail in some degree. You therefore need back up after back up. Consider the psychology of the student at this point, you are in some way teaching them based on a premise of failure! On the other hand you are teaching them a large amount of techniques and skill to defend themselves against a huge amount of changing variables. Which one is the most efficient? Teach a student to have the mindset of a warrior? Or the ability to be over skilled? Well the answer is both together and if you agree with this, then mindset and psychology should be part of your teaching and training the mind should be more important than technique. In the second statement above, there are no variables and you are making the assumption that every move you make works and the attacker will then react in a way that can be predicted. This in itself brings its own very specific problems, namely, if your technique hits the correct target with the right amount of force, then you need to have knowledge of the body’s reactions, the psychological impact and the physiological effects that will occur. The only real problem here is that you are teaching a process that does not allow for variables. To enable a sound-learning platform, lets take the second statement and look at this in the context of an attack. The first thing to clear up here is that I am starting from the point of the attack and not the lead up to the attack, so all of the fight foreplay has happened and you find yourself faced with a guy that for what ever reason has decided to attack you! This is not a surprise attack. There are a couple of real important points here. The person being the aggressor, that has decided to hit you, has no clue, unless you have told him, that you are a trained fighter. He has made an assumption that you know nothing and feels he has the ability and the advantage to take you on! The likely target that has been chosen is your head. These two points also give a clue to the psychology of the attacker. Lets now look at the thought process of the attacker. Again I have moved on from the preamble, I am at the point where the decision has been made. What I really want to look at here is the innate non-cognitive thought process, not the conscious thought! That’s already been done. He forms his fists, raises his hands and punches towards your head. If he knows nothing it may be a swing. If he knows a little it could be direct. If he is well trained then a distraction may come first. Whatever the training, the attack’s on its way! Unless the attacker knows your level of training, and for this section I will assume he does not, he is already expecting consequences to his actions. The first is contact, his mind knows what is coming, and it will have already prepared his body to receive force. He will also have perceived exactly where the target is in space and time. Most of the intake for the senses will be received via the eyes. Just like a lazer guided missile it is locked on target. Due to bilateral symmetry, at this point being in an autonomic process he will have two fists formed. From the initial contact a second strike may well have also been pre-programmed into his attack. As the fist makes contact with a head the sanatoma sensory system will relay information to the brain and automatically make adjustments to muscles that are backing up his force. In several surveys carried out among door staff it was found that the right punch was the initial choice of weapon in the majority of street encounters. It also showed a nearly perfect choice of target was the head. So why a right fist and why the head? To answer these questions we have to look at how the brain and the body are wired. Suffice to say here that the head is always the focal point, its what we use in the majority of our communication skills – it’s the mind that is the attacker, not the body. The body is just the tool used by the mind to perform its required actions. The mind is therefore the core root of the problem; it’s where the computer is stored. If we analyze this very small section of the attack and consider alternatives to this action we may well discover some very interesting points. What would happen if all of a sudden there were stimuli so great that it stopped the mind’s work right at that point where he was swinging? Would the mind have the ability to make adjustments? Or would it have to reset itself, just like our computers need to be rebooted due to an overload? What would happen if the defender were very skilled, had already perceived that the attack was on its way and was waiting for the trap to be sprung? Yes they could make a pre-emptive strike. It has been scientifically proven that action beats reaction! But don’t forget that the reaction is against an unperceived attack. There are recorded cases of slowed time…ok it’s not slowed time but actual increased perception and sensory recognition on the part of the brain. This usually happens when a critical situation is occurring and the body is in autonomic mode. This mode occurs when the heart rate is at 115 to 145 beats per minute and the situation is critical. At this point it has been documented that movement that is usually not recognised is seen with pure clarity. Bullets can be seen, muscle contractions, the smallest movements are detected. This is not some super human ability; this is the basic body function that is engaged to protect the organism. While in this state the body is also capable of movement at great speeds, faster than any conscious movement, almost as fast as a startle reflex. For an untrained person there is the other side of the coin to consider. Loss of gross motor skills, freezing, tunnel vision, auditory shut down and a host of other physiological reactions. Coming back to my point, if you have trained correctly there is no reason why you should not be capable of moving fast enough to interrupt your attackers movement as long as the attack is not a surprise, you must also have correct trained programmed responses ingrained into your mind and body. If this is the case and you meet his swinging punch, somewhere in between the start of the movement and contact with your face you will have managed to interrupt the innate thought process that is occurring within their mind. Their arm will be stopped prior to the perceived contact point. At this precise moment in time the attacker’s mind will suddenly have had a different stimulus occur, they will have to reboot, create a work around and then throw another punch with the other hand. This reboot is like an eternity in the middle of a violent encounter and will give you more than enough time to beat his action. The biggest problem is that this state of mind, is the hardest area to train and that is why the Psychology of Confrontation is so important. There is also the fact that if you are well versed in this type of critical event you will be able to send indicators to your attacker that will tell them that you are being submissive rather than confrontational. Again this sets their mind down a false path of perception; this is perhaps the most valuable of tools. Training via different mediums using the mind is of great importance, using mental imagery training, adrenal control breathing and stimulus based responses will go a long way to giving you the edge. It is obviously the case that within any violent encounter the reactions of your attacker to being hit will be highly variable, however if you constantly analyse this interaction and develop a good understanding of the psychology and physiology of the human mind and body, you will be gaining very valuable tools. These tools are not often covered within the majority of schools; I intend to start to look at a few of these interactions and responses in more detail within my next article along with looking at a surprise attack and the bodies reactions. Chapél R, (2006) Personal seminar teaching notes. Here I will explore the world of group aggression, I will touch on warfare, mob attacks and basic instincts. I will also be introducing the Promo clip to my latest Multi Attack DVD and hope that you all enjoy the material. I will be launching the DVD within the next couple of months. So let’s get started. Is it part of our basic instinct to act as part of a group in aggression? All of the above have answers that are may not be what we would first expect! 1. Is Group aggression natural? Group aggression is the violent behaviour of 2 or more individuals against another group or individual. its important here to note that it is not Warfare, that is the killing of our own species. Group aggression for this blog will centre around the dynamics of 2 or more individuals using aggressive behaviour against an individual, but first some background information. Group aggression is first, foremost and primarily a species’ instinct of survival of the fittest. Groups in the past that used aggression survived and reproduced more often than those that did not. By this I mean an instinct in-built to our natural behaviour, designed to protect and preserve any species not just mankind. It is primeval not social, by this I mean it evolved as part of our survival of the fittest mechanism, not as a reaction to social problems. It is quite un-nerving how group aggression can swell from a few to a mass mob, with no seemingly logical reason for it. Individuals that you may think are least likely to get involved in group aggression, get involved! This was witnessed recently in the riots in the UK. It is quite evident therefore that group aggression is part of our make up and has been for thousands of years, but for what reason? Generally it’s to enable the fittest to survive and reproduce, the more success a group has over another, the more attraction there is for those to join such a group. In today’s environment things are a little different, but there still exists that need to be part of the strongest tribe, gang or group. 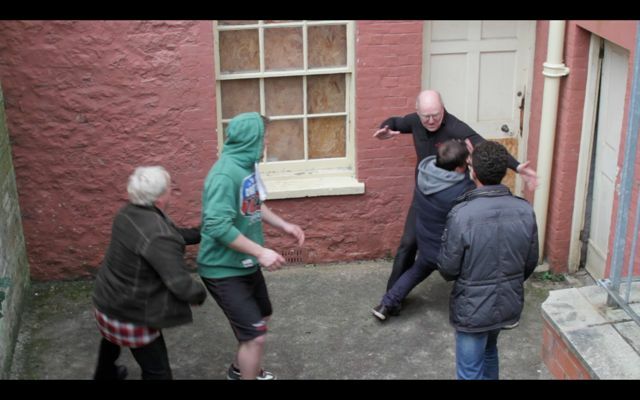 Being attacked, or coming under aggressive behaviour from a group within a fighting context is one of the highest skill sets that you could attempt. Let’s be very clear here, your first option when faced with numbers is to “exit” the area or building. Do not engage, unless you have no other option. The second very clear point, is mental attitude, not skill! I have touched on this in past blogs, if you believe for even an instant that you are out numbered and are going to get hurt, then that’s exactly what’s going to happen. You have to have the mindset of a warrior to deal with group aggression. This part of the skill set is the hardest to teach! how do you teach an attitude of the mind? Well there are ways, for now it’s just as important for you to have considered the consequences of engaging with a group along with your likely odds of surviving and then accepting those odds when the encounter happens. If all else fails and you have no option but to engage then you have two further options. Remember that “all else” means running! So if running or talking your way out does not work, you will have to engage the group and let’s be clear you are going to have to bring a lot to the table to increase your odds of not getting too hurt, I say this because it’s important that you accept the fact that you are likely to get hurt if faced with group aggression. The first of your two options is to set an ambush, if at all possible, catch the group by surprise and take the fight to them. You can not afford to hesitate in any way, if you do then you are likely to fail. If you are capable then you need to increase the violence considerably to a level far higher than the group expects, the louder the noise the greater the chances of success! The ambush should be designed to take out the first available target that enters your critical range. Your aim here is to bring to the table a higher level of aggression than the group are bringing, switching the psychological advantage in an instant and always being prepared to go as far as necessary to survive. You will certainly need skill that’s for sure, lets talk about that a little later. Not being able to set an ambush will leave you facing greater odds, the way in which the group will bring aggression upon you is varied and forever inventive. They will feint, intimidate, bully, mob, overpower, trick and basically do anything to dominate you. Do not be lulled into thinking that the leader will be out front, they may be in the rear controlling their pawns, they could be out front, but never assume. If at all possible equalise the situation, if none are available taking the fight to them and using the tools above are even more critical. Taking the fight to the group and attacking the attack will help the odds, taking out the biggest is not always the best policy, the most aggressive may be the smallest, once again, never assume! The will to survive and your mental attitude are your best chances of getting through such an encounter, remember it’s not just the moment of the encounter, you will also have to deal with the after shock and the mental frailty that you may feel. The hardest thing here is to explain in words what you have to do, that’s where my new Multi Attack DVD comes in, you will clearly see the skill and learn some of the required mental forces that you will need to use. The Mob goes all the way back to Darwin and his survival of the fittest. A great many species use mobbing as a means to protect the survival and reproductive fitness of the group. Remember walking your dog in a field of cattle and then being literally charged by the group, or birds mobbing other predatory birds or small animals. There are recorded events of chimpanzees using raiding parties to overcome and intimidate other less aggressive groups, mobbing single individuals, singling out vulnerable individuals and even killing other groups all in the pursuit of evolution and adaptation, survival and reproduction of the fittest. Therefore it should not come as too much of a surprise that we humans use the same tactics within our own human behaviour. 2. So what about Warfare is it natural or a result of our social interactions? That’s one for later, I think that it is more relevent to this blog to stick to aggression and come back to Warfare in a later Blog. Earlier I mentioned that skill will be a required requisite for being able to even the odds a little when it comes to the engagement of a group or Mob. The skills needed will require honing, practising and constantly working on, if you are to stand even a slim chance. So, other than the mental attitude and pre and post engagement considerations, what skill do you need? Will you for example, be able to spend time dealing with one attacker and then moving on to another? I think not. If your technique requires multiple strikes to put down one guy then you are in for a rough time. You will need, above all else, to make each strike count. So every strike that you make will need to have all of the following, precision, power, speed and timing. Remember you will not have the time to hit one guy 4 or 5 times in the same place, you need to hit and move, bringing to bear an overwhelming degree of aggression and skill, anything other than this and your odds of surviving such an attack will reduce significantly. You will need to be hyper aware, in control of your own physiology and able to move, getting rooted to the spot for example is not going to help, and remember, at the moment, I am discussing an un-armed mob, however the inclusion of weapons will change the dynamics considerably. Going to the ground is to be avoided at all costs, you will quickly become a victim if your game plan involves taking any of the group to the ground. 3. Is it part of our basic instinct to act as part of a group in aggression? I believe that this has already been answered above, but just to clarify. Being attracted to a strong group or mob, will in all likelihood result in members of that s group surviving longer and reproducing more, a typical Darwinian answer, but nevertheless the logic is good and it stands to reason that this behaviour is part of our natural instincts to survive. The problem is that some use this as an excuse to cause mayhem and fear to other weaker individuals or groups in todays social World. Let me know what you think and stay tuned it is due for release in downloadable form very soon. Tap or I will break your arm! Then I will poke your eyes!! We can poke the eyes too!!! Tap or I will break you arm! Then I will poke your eyes!! We can poke the eyes to!!!! The above comment was written on-line in a response to a disagreement regarding the effectiveness of modern MMA cage fighting and the fact that it is a sport and not real street reality based fighting. There are as many opinions about this subject as there are methods of training. So how can this subject be explored without a bias to either reality based, real in your face street violence and cage, referee, rule controlled MMA? Let’s first take a look at some of the arguments that seem to pervade this subject. Reality is exactly that, your life is on the line – MMA fighters are just as capable of defending their lives. Reality will use targets not allowed in the cage – MMA fighters can use these targets if they wanted to on the street. There are no rules on the street and no referees – MMA has a referee for the safety of the fighters. The street is real it’s not a sport – MMA may have a winner and loser, it is a sport and represents real contact. MMA fighters are conditioned professionals – Martial artists are also conditioned. All fights end up on the ground, so train for it – In reality most fights are stand up. From the above what ever side of the fence you fall on there is always a counter to the argument. Is there a way in which logical thought can be used to explain the difference, or is it just the case that emotions will always play a part in this type of debate? Is there an area that the martial artist trains that the MMA doesn’t? Even between Martial arts there are arguments or differences of opinions on which martial art is reality based and more effective than a traditional art for example, it seems that ego has a huge part to play in people’s arguments, dealing with the facts and evidence is one thing, but people’s opinions are something else. So lets see if we can not separate the wood from the trees. MMA today is one of the most popular sports out there, huge numbers are attracted to the sport and its no wonder that it is very aggressively portrayed as the ultimate in martial arts. Over the years since its inception MMA has seen a change in the dominant skill that has enabled its fighters to win. From the start it was ground work, take them to the ground and tap them or choke them out, then stand up, then the ground and pound, it’s influences have changed. What has not changed is the conditioning of the individuals that take part and the mindset needed to prepare for and enter the cage. Logic would dictate that a professional MMA fighter in peak condition being caught in a street altercation should prevail every time. I use the word altercation rather than fight, to separate out the thought process that a fight involves two parties, often violence on the street only involves one aggressor. Why? due to pure physical fitness, conditioning, experience, mental preparation and of course ability. Does this mean that the non MMA guy does not have a chance? Does this invalidate all other Martial Arts? Context plays an important role here, if the average Martial artist were to enter the cage against a trained professional MMA fighter, I believe the odds are against the Martial Artist. On the street, especially if the art you practise is designed for a reality based situation then the odds swing a little more in the Martial Artist’s favour. Bring a weapon into the equation or multiple attackers, then the Martial Artist has the edge. 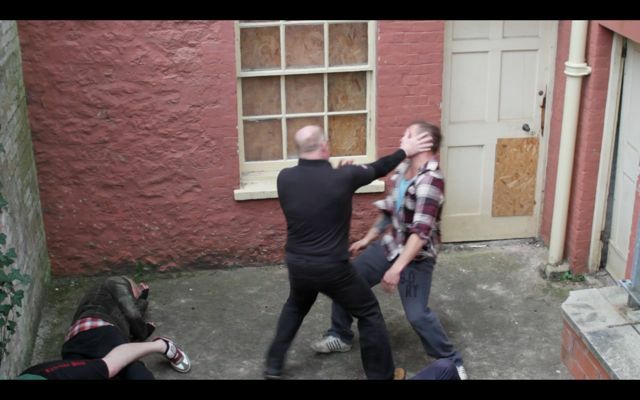 Against non trained aggressors on the street, even more odds get stacked in the Martial Artist’s favour. Later this year I will be releasing a couple of DVDs on the subject of Multiple Attacks, so stay tuned, the trailer will be out very soon and a blog on multiple attacks will be here to. But what about that part of the title that says “we can poke the eyes too”? Well that is a different story and the answer is not so easy! Not having time here to go into the history of human evolution or evolutionary psychology, it’s a fairly well-known fact the human beings in the main do not want to harm other humans, there are of course always going to be those that are not quite wired the same as the majority, but the good news it, that those who are not are in the 3 to 5 % minority. Research into killing rates during the last few wars and detailed in David Grossman book, “On Killing” give a good understanding of this. He also covers the point that killing becomes ever harder the closer and more personal it becomes. Taking your fingers and shoving them into another person’s eyes takes a huge amount of mental fortitude. This type of A social violence is one of the hardest things to train, there are ways in which this can be done, but few schools teach what it takes to achieve this. Using the words “just poke them in the eyes” is easy to say, but the action is far from easy. So using glib statements points more towards your understanding of human behaviour than you may think, it takes a great deal for those not capable of this action to admit the shortfall in training. I am not talking here about flicking or non committed moves towards the eyes, I am talking about full on finger penetration of the eye-ball, the eye socket and the grey mass behind the eyes. Without getting too carried away with dramatic pictures, this one of Roy-Jones Jr, gives an idea of a small proportion of the damage that can be caused when the eye is damaged, but nothing near the amount of damage if the eye was the direct target. Human behaviour is at the heart of what we as humans do innately. We have evolved over thousands of years and descended from primitive beings to the highly social animals that we are today. We are born with innate behaviours built-in for our survival, we learn behaviour and some behaviour is just the result of an accident. So poking people in their eyes is certainly not an innate behaviour and therefore is a learned behaviour, as is most of the martial techniques that we learn today. We have natural ways of movement, but no natural innate way in which we kill each other, they are adapted and definitely not inbuilt. That’s wrong! This is the correct way! How many times have you heard this? “Thats wrong! this is the correct way” it can be packaged up whatever way you like, in the end it comes down to an instructor stating that they know the way that it should be done and you are the student, so your role is to follow and mimic the moves exactly! I often ask the question during seminars, or of new students that have a degree of experience, “why do you do the move that way”? All too often the reply is, “because that’s the way my instructor taught me”. On the face of it this is not a problem, you may think to yourself maybe he will give me the answers later. You put complete trust in your instructor and the Art that you have chosen to partake in, how many of us students and I include myself as a student, ask ourselves why we started the art we did? New students are what keeps any Martial Arts school running and they are attracted through the door in a great many ways, drawn to the mysticism of the arts. There is absolutely no problem training in any art, just as long as you are aware of the reasons for your choice and the goals and direction that your chosen art follows. You may have chosen a traditional art which requires hours and hours of focus on one move, with an absolute dedication to the historical application of your moves, or maybe one that has a focus on spiritual understanding, traditional Chinese or Japanese weapons, street self-protection, the list goes on. What’s important is that your instructors are clear with regard to the arts application. The one thing you do not want is an art designed for the ancient battlefield trying to cope with the yob down the local Hostelry. All I am saying is be clear on the reasons for starting the art you choose, keep an open mind and always ask questions. If we understand the reasons behind the teaching, it makes it easier to accept being told “that’s wrong, this is the correct way” when practicing a more traditional art. The essence of the art itself is the discipline and the self-control needed to emerge yourself completely in mastering the exact movement required. This type of practise is arguably the hardest of all especially in today’s environment of quick fix sensory input where students quickly become bored and want to move on to the next part of the technique. Being continually corrected on the smallest of detail soon tests the patience of the student. The point with regard to the title of this Blog comes into question when the subject of the art is self-protection in today’s environment, especially if you have been told by your instructor that what he is teaching you is the answer to all the problems that you will ever encounter on the street today! I have heard instructors say “this is the way it happens, and this is what you have to do, if anyone says anything different then it’s just BS”! They are the complete authority on the subject and what they say is written in stone. We all have egos but this type of statement speaks volumes as to how large theirs are. Keeping a check on ourselves is maybe the hardest thing in the world, that’s when you need a balancing element to yourself and your teaching. One size does not fit all especially when it comes to protecting yourself. In any street encounter the one thing you can guarantee is that the violence and the moves required to survive have no set path. Those few techniques that you were told would fit suddenly abandon you and you find yourself in an unpredictable constantly changing situation, which you have to meet with spontaneous movement and a mental attitude that ensures your survival. Being manipulated and controlled within a set perimeter of techniques, without the room to alter or adapt might not be the best way to achieve this. Remember the statement by Bruce Lee “learn what is useful and discard the rest” how do we know what is useful and what should be discarded? Especially if we are constantly told that the way we are moving is wrong and this is the right way. What do you think are the reasons that some instructors want to be so controlling? Is it a power thing or maybe insecurity?. Who knows, the important thing is to be aware of the potential problems. That way you can avoid being in a class where the above statement occurs and then find yourself in a situation that you are not equipped to deal with, both physically and mentally. Arguably your mental skills should be better than your physical skills, you should first seek a path of peace and not war. What should be gained from the above, is how lucky you are if you find an open secure instructor, one that encourages learning, not just from his own art but from others as well. Always be mindful of the reasons why instructors preach that what they do is better than everything else out there. None of us have all the answers and we can all help each other. The Martial Science University, headed by Dr R Chapel has the motto “integrity through excellence”, walking the path of integrity and honesty should go hand in hand with instructors values, especially when you are in the responsible position of teaching others a Martial Art that is designed to potentially one day save your students or one of their family member’s life.